CNMI Marriage Encounter: Luau of Love Tonight at PIC! The CNMI Marriage Encounter is organizing the Luau of Love Cocktail Party tonight at PIC's Seaside Grill from 6:30-9:30pm tonight! The price is $22 per person or $44 per couple and includes food, open bar, games, dancing and raffles. 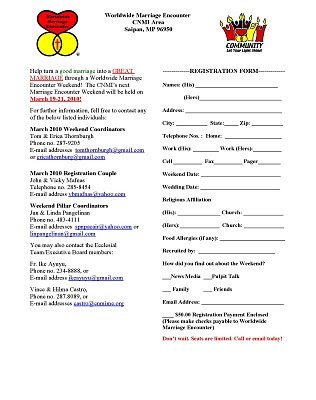 This is a great opportunity to invite prospective couples for the next ME Weekend, scheduled at the Saipan Grand Hotel on 19-21 March 2010. We look forward to welcoming another 20-25 couples to enhance their marriages through ME. Tickets for tonight are available at the door. See you then!